A teenage trapshooter from Alaska will return from the ISSF World Championships with a silver medal. Seventeen-year-old Grayson Davey of Anchorage, the youngest shooter in the competition, delivered perfect shooting in the final round to help the United States secure second place in men's team trap Monday at the World Championship in Changwon, South Korea. It was the first medal for the United States in men's team trap since 2006, when the Americans took bronze. Sharing the medal with Davey were Glenn Eller, 36, of Texas, and Jake Wallace, 28, of California. Wallace will compete again later this week with Eagle River shooter Corey Cogdell-Unrein in mixed team trapshooting. 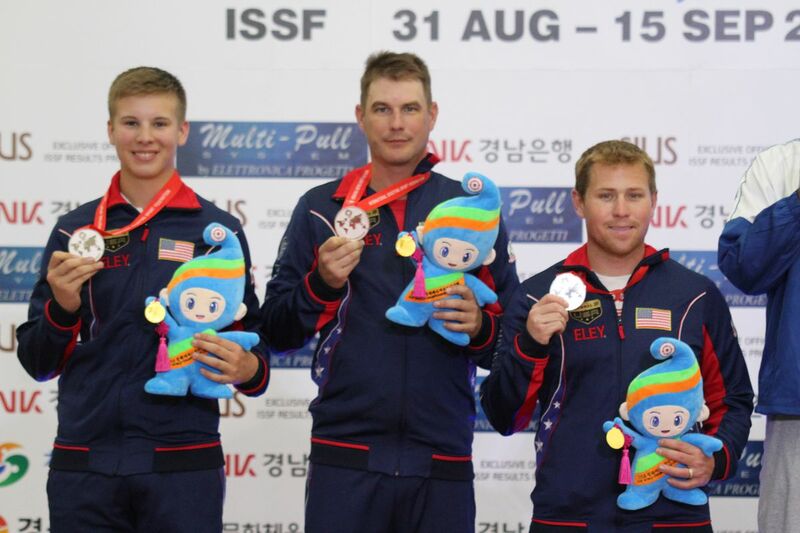 Davey, a rising star for USA Shooting, was the youngest men's trap competitor by three years. He is about to graduate high school through the Family Partnership charter school and is taking classes at Alaska Pacific University when he can coordinate them around his competition schedule. He is ranked 14th in the world following Monday's competition. Team trap scores are a compilation of men's trap qualification scores from each country's top three shooters. Eller led the Americans by shooting 123 out of a possible 125; Davey followed with 120 and Wallace was next with 117. In his five rounds of shooting, Davey fired three perfect 25s plus a 23 and a 22. With 360 total points — a number achieved when Davey fired a perfect score of 25 in his final round — the United States was tied for first place with Kuwait and Italy. The tie-breaking process left Kuwait with gold, the United States with silver and Italy with bronze. In individual competition, Alberto Fernandez of Spain captured the gold medal. Eller, a 2008 Olympic gold medalist in double trap, was the only American to qualify for the six-man finals, where he finished sixth. Davey placed 18th in his world championship debut and Wallace placed 40th. Davey earned the chance to compete at the world championships by winning, at age 16, USA Shooting's Shotgun Fall Selection match last year in Arkansas, where he outperformed a number of older and more experienced shooters like Eller, a five-time Olympian, and Wallace, a former world champion.